SKU: 6811912 Categories: Anatomicals Hand Wash Pumps, Anatomicals Showering Items, Body Wash Items, The Mama with Attitude. 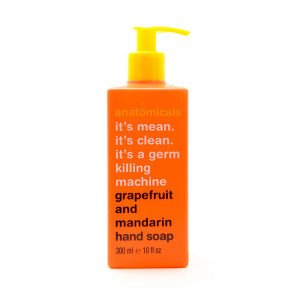 Tags: €10 & under, 300ml hand wash, anatomicals hand wash, bacterial hand wash, best hand wash, grapefruit hand wash, it's mean it's clean it's a germ killing machine, mandarin hadn wash.
Closely examine your hands. Turn them palm down, then palm up (you really should get that hair removed). If they were a country, they’d be a rogue state; a pariah nation, a breeding ground for terrorism. Think we’re exaggerating? Germs are worse than any crazed fundamentalist madman. They don’t care who they endanger. No wonder you need this liquid soap. With anti-bacterial blasting ingredients, it will lay waste to the hopes and deranged dreams of the evil E.coli and others, all now brought to justice by anatomicals. Anatomicals It’s Mean it’s Clean it’s a Germ Killing Machine, grapefruit hand wash, anatomicals hand wash, mandarin hadn wash, best hand wash, 300ml hand wash by Anatomicals is a fabulously natural hand wash which will transform mucky mitts by removing stubborn stains and beastly bacteria. So don’t be cruel to your paws and treat them nice with this ultra cleansing hand treat that won’t strip your hands of their natural oils. The uplifting blend of Mandarin and Grapefruit will leave busy paws fragranced, refreshed and revitalised.